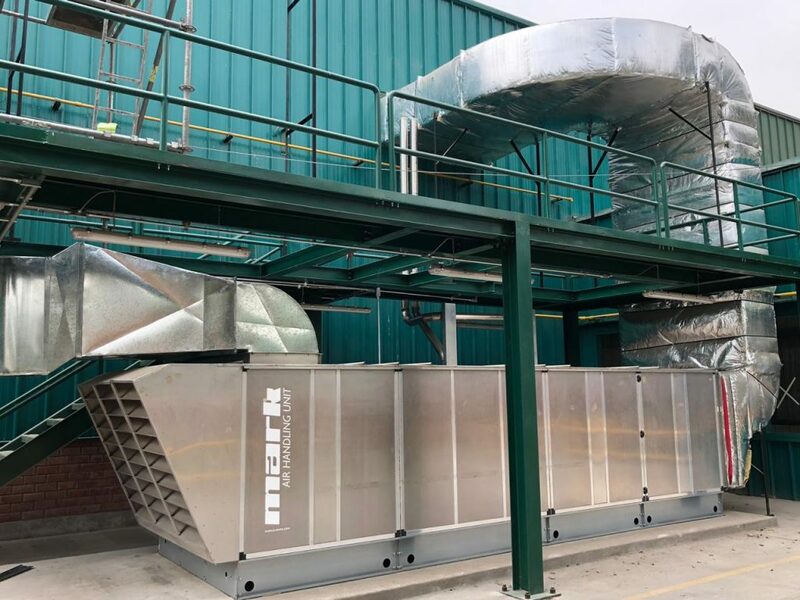 At the start of 2018 Mark has supplied an AHU 35-25 to a paper processing company in Peru. The unit provides 32.000m3/h of air and is equipped with two gas fired G+200 high efficiency heating modules. Modulating recirculation dampers provide the option to recirculate air from the building and therefor lower the overall gas consumption of the unit. As standard the Mark AHU series are made from seawater resistant aluminum panels. With the stainless steel heat exchangers of the Mark G+ condensing heating modules, this provides an excellent solution for the humid and coastal environment of Lima, Peru. The unit was divided in four sections for economic transportation in a standard 40FT container. On site in Peru, the AHU has been assembled by the local service team of the client. Thanks to the simple modular design and Plug and Play control system, the machine has been put into service without intervention of Mark staff. Fine tuning and final commissioning of the control system could be done from the Mark HQ in the Netherlands, thanks to the integrated webserver technology. 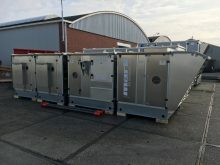 The AHU is used for heating a new warehouse to a temperature of 35 degrees Celsius. This temperature is required for post-drying of manufactured paper products. A second unit has recently been ordered.